Naturally, pet owners ask our veterinarian in Laguna Nigel many questions about pre- and post-operative instructions for pet surgery. We answer the most common ones here. Our emergency veterinarian in Laguna Hills is very skilled in all types of pet surgery, so if you have lingering questions, call 949-768-1314. How do you decide if my pet needs surgery? Surgery may be indicated if symptoms and diagnostic testing indicates a health problem that can severely impact the quality or length of your pet’s life. For example, if your pet’s stomach is distended and painful, he or she may have an intestinal blockage that needs to be operated on immediately. Our emergency veterinarian in Laguna Hills does all the testing to determine what needs to be done and discusses it with you. The same testing is also done before preventative spay and neuter surgeries. 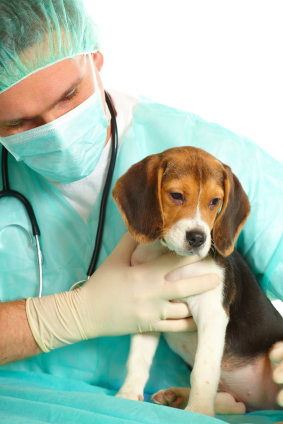 What should I do to prepare my pet for surgery? We ask that you not allow your pet to eat any food after about 10:00 PM the night before, but still allow your pet to drink water. If possible, take your pet for a short walk to make sure he or she has eliminated just before you bring him or her in for the appointment. If your pet has any other unique needs before surgery, our veterinarian in Laguna Nigel will discuss them with you beforehand. Will my pet need pain medications? Dr. Kerolos will prescribe a course of pain management medications for you to give your pet for a few days as he or she recovers so that your pet can stay as comfortable as possible and get the rest he or she needs. It is also important to keep them in a quiet, comfortable location (like a crate or kennel) where they can sleep and rest without being bothered for the first couple of days. What should I feed my pet after surgery? Feed your pet only small portions of food and water each hour the first night, monitoring how it all stays down. Small, frequent meals help prevent post-op stomach upset. Many pets are not interested in food the first night after they return home, and this is fine. If they do not start eating again after the first day, contact our emergency veterinarian in Laguna Hills. How do I care for my pet’s surgical wound at home? We will give your pet a cone to wear so that he or she cannot lick the incision. Keep the area clean and closely monitor it each day for about 2 weeks. During the first 24 hours, some discharge, swelling and bruising is normal, but the area should improve each day thereafter. Call right away if it does not improve. Our veterinarian in Laguna Nigel is always ready to answer any other questions you have about your pet’s health, so call us at 949-232-1788 and just ask!